FILE PHOTO: A worker waters plants next to an advertisement billboard of Abbott in Mumbai, India. NEW DELHI - The United States is pressing India not to extend price caps on medical devices and wants New Delhi to allow firms to withdraw products from the market if they do not wish to sell at government determined rates, a U.S. trade official told Reuters. 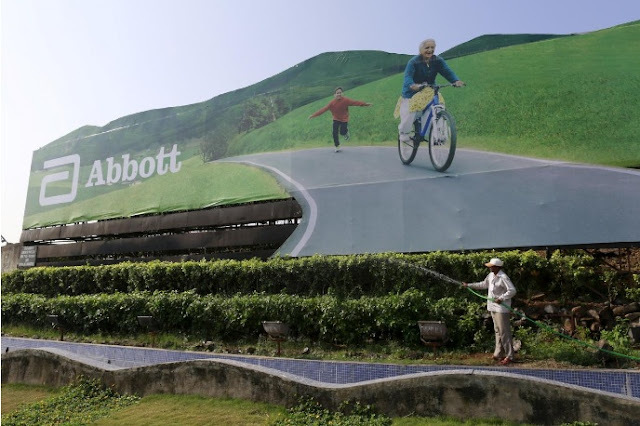 But the $5 billion Indian medical-technology industry - which counts U.S. firms such as Abbott Laboratories, Boston Scientific Corp and Johnson & Johnson as key players - has protested these moves, saying they hurt innovation, profits and future investment.